Handmade in the UK using solid steel components the Buckingham metal driveway gates will add a visually appealing statement to the main entrace of your property at a very affordable price. The 3ft high Buckingham Double Metal Driveway Gates are handmade in the UK to an exacting standard and feature a decorative wrought iron style design making giving them a timeless appeal that is so popular at present. Constructed using high quality solid steel components the Buckingham gates are available to buy online in a sizes ranging from 7ft 6” up to 10ft and as a result are suitable for most domestic applications. Numerous decorative elements create a stunning wrought iron style. Available to order in a selection of sizes. Provides additional security to the main entrance of your property. 20mm x 8mm flat bar steel frames, 10mm infill bars and 10mm x 3mm scrolls. Easy to install the gates are supplied with surface mounted adjustable hinges (compatible with existing masonry, steel or timber posts). Select the width required from the menu above. The sizes represent the opening into which the driveway gates will fit. We have already made an allowance for the space needed for the hinges and latch. 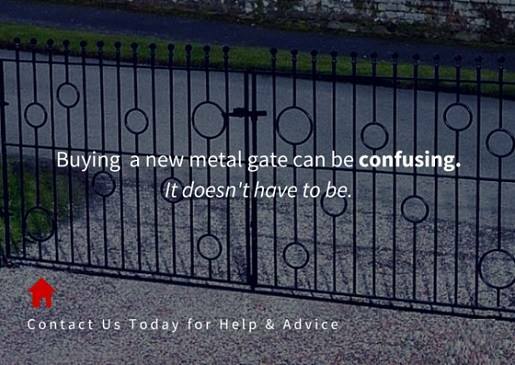 Confused about ordering Driveway Gates? Speak to the experts now by calling 0844 804 5577 or email your questions to sales@gardengatesdirect.co.uk. Alternatively you will find lots of useful information online if you refer to our measuring guide, ordering guide and installation advice pages. You may also find the information contained within the links below very useful. Can`t find the size you need? Find out about our made to measure service. To complement the traditional Buckingham double metal gate design or to help with installation we are pleased to have the following optional extras available. Zinc plated (electro galvanised) and powder coated paint finish (a range of stock colours are available). For more information or for technical advice choosing the best posts to suit your configuration feel free to contact us for further assistance.